In this installment of our monthly Italian date night, we finally get a chance to check out L’Artusi. Created by the same creators of dell’anima, L’Artusi is known primarily for the pastas (duh) and cheese dishes. 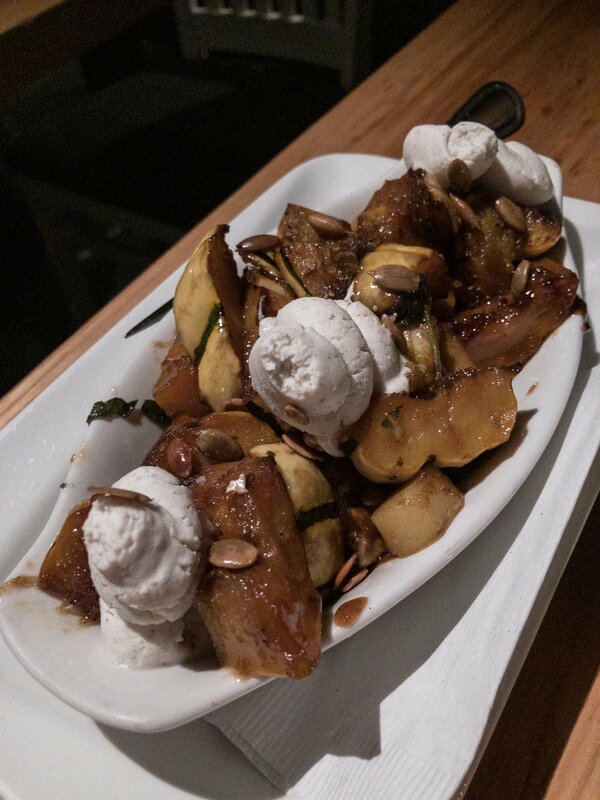 We had a chance to try the famed orecchiette at Eeeeatscon, but we had to come back and experience the restaurant in person, and it totally did not disappoint! Definitely one of the better pastas and pasta concepts in the city. We started with Chicories parmesan, lemon, anchovy dressing. I’m not sure what prompted us to get a Kale salad but it was fresh and delicious, the smoked ricotta really bringing a whole other dimension to the flavor. Next was a special, Delicata Squash with maple and chevre. Easily the most inventive dish of the evening, with amazing sweetness from the squash balanced with the goat cheese. With the kale and this dish, we could easily see why L’Artusi is known for their cheesy dishes. Finally we had the 2 pasta dishes: Bucatini with panchetta, tomato, chilies, and pecorino, and the night’s pasta special, a Black & White Pasta (half squid ink half regular), with swordfish and brown butter. Bucatini was easily one of the best pasta’s we’ve had all year. With just a little bit of spice, the bucatini created the perfect ratio of sauce to noodle. The black and white was such a cool concept. While the flavors didn’t blow us away, the swordfish cooked to perfect tenderness.